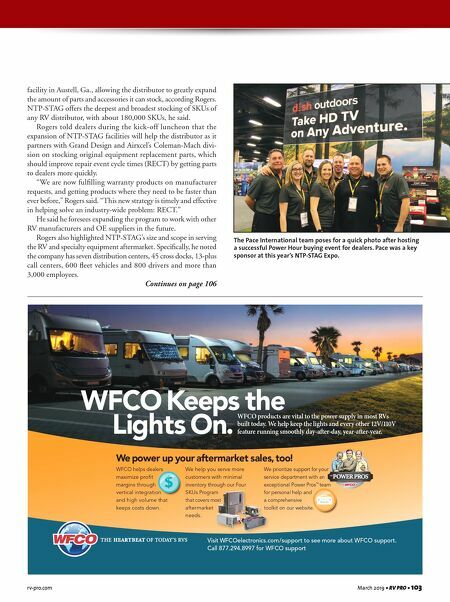 Distributor Show Coverage 102 • RV PRO • March 2019 rv-pro.com A F T E R M A R K E T Rogers also highlighted the debut of NTP-STAG Marketing Garage and the expansion of the distributor's Parts Via program. The Marketing Garage is a digital toolbox dealers can use to easily boost their social media presence. NTP-STAG pro- vides the text and images, which dealers copy and download, respectively, to their own social media sites and then post as their own content to raise the dealership's profile and potentially attract more business. Separately, NTP-STAG has expanded its Parts Via eCom- merce solution, which links together suppliers, consumers and dealers. The program debuted last year but has gained several participating suppliers since then. With Parts VIA, NTP-STAG's website serves as the point of consumer engagement and facilitates the transaction. The product is either shipped at no cost to the customer to a par- ticipating dealer's store for installment on the customer's RV or with a shipping charge directly to the customer, but the dealer receives a commission either way. "Parts VIA taps into a sales channel not currently being captured using traditional customer acquisition strategies," Rogers said. Meanwhile, to make the ordering process for dealers simpler by letting them lock in orders early, for a second year NTP- STAG brought back its Pre-Cart system. Pre-Cart works just like an eCommerce shopping cart, allowing dealers to place orders in advance of the show electronically using the distrib- utor's VIA B2B eCommerce site. "Our Pre-Cart option within VIA allows our customers to get a head start on building their show orders," said Rogers, noting that dealers often make use of it for things they typically buy at the Expo, like sanitation and cleaning products. Notably, for this year's Expo, about two-thirds of registered dealer accounts came prepared with some of their buying pre- planned, and pre-cart sales totals were up more than 50 percent from 2018, according to Rogers, who described the development as a "very significant sign." Meanwhile, technology advancements also influenced how orders are placed at the show. 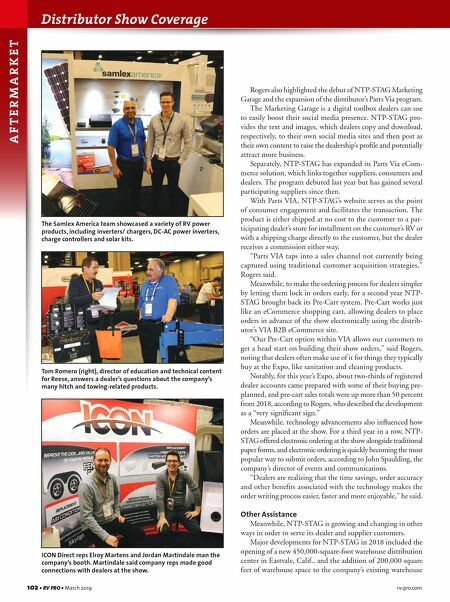 For a third year in a row, NTP- STAG offered electronic ordering at the show alongside traditional paper forms, and electronic ordering is quickly becoming the most popular way to submit orders, according to John Spaulding, the company's director of events and communications. "Dealers are realizing that the time savings, order accuracy and other benefits associated with the technology makes the order writing process easier, faster and more enjoyable," he said. Other Assistance Meanwhile, NTP-STAG is growing and changing in other ways in order to serve its dealer and supplier customers. Major developments for NTP-STAG in 2018 included the opening of a new 450,000-square-foot warehouse distribution center in Eastvale, Calif., and the addition of 200,000 square feet of warehouse space to the company's existing warehouse The Samlex America team showcased a variety of RV power products, including inverters/ chargers, DC-AC power inverters, charge controllers and solar kits. Tom Romero (right), director of education and technical content for Reese, answers a dealer's questions about the company's many hitch and towing-related products. ICON Direct reps Elroy Martens and Jordan Martindale man the company's booth. Martindale said company reps made good connections with dealers at the show.